A deed of assignment used to transfer contractual rights and obligations from one person to another. The Deed provides for the outgoing party to promise the contract is valid and up to date. The incoming party promises to meet all future obligations under the contract and indemnify the outgoing party from breach. 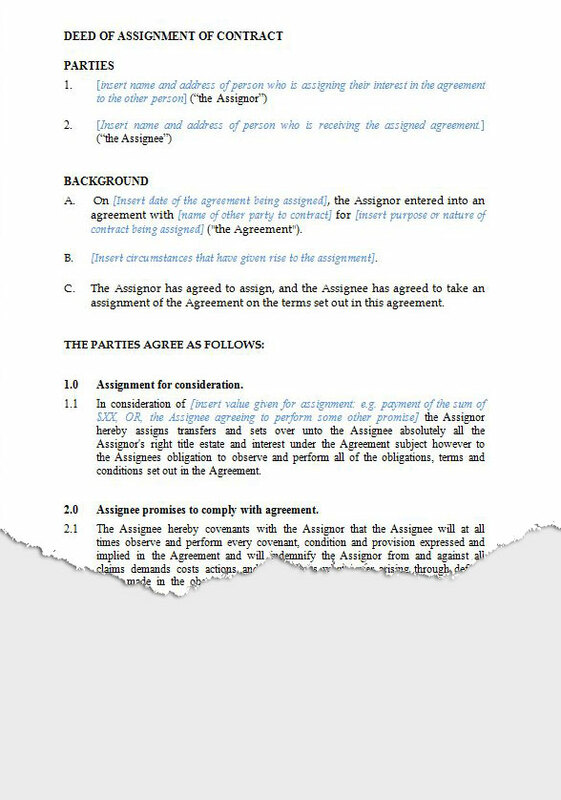 The other party to the contract gives consent to the assignment and confirms the contract is up to date. An assignment does not avoid the original legal responsibility of the assignor. If the assignor is to be released from all liability, a Transfer of Contract (novation) should be used. A deed of assignment is used to transfer contractual rights and obligations from one person to another. The Deed provides for the outgoing party to promise the contract is valid and up to date. The incoming party promises to meet all future obligations under the contract and indemnify the outgoing party from breach. The document contains a notice to be given to the other party to the contract who is not a party to the Deed of Assignment. An assignment does not avoid all legal responsibility of the assignor. If the assignor is to be released from all liability, a Transfer of Contract (novation) should be used. A deed of assignment is used to transfer the right to be paid a debt from one person to another. If the person paying the debt is to change, then a transfer of contract (novation) form is required. With an assignment, the Assignee (the new creditor) pays the Assignor (the original creditor) for the Debt. The Assignor confirms the debt is current and enforceable. This can be useful to transfer debts amongst different entities, or persons, so one entity buys out a debt owed to another and can collect it in the future as it falls due. This document includes the debtor as a party who is acknowledging consent to the assignment. That avoids the need for separate notice to be given to the debtor. A deed of assignment is used to transfer the right to be paid a debt from one person to another. If the person paying the debt is to change, then a transfer of contract (novation) form is required. With an assignment, the Assignee (the new creditor) pays the Assignor (the original creditor) for the Debt. The Assignor confirms the debt is current and enforceable. This can be useful to transfer debts amongst different entities, or persons, so one entity buys out a debt owed to another and can collect it in the future as it falls due. This document includes a separate notice of the assignment to be given to the debtor. An agreement that provides for a purchaser under a contract to nominate someone else to be the purchaser in their place, with the consent of the vendor. The new purchaser (Nominee) agrees to perform the obligations of the purchaser under the contract. The original purchaser is still liable to the vendor if the Nominee defaults. If the original purchaser is to be removed completely, then a deed of novation should be used instead. An agreement that provides for a purchaser under a contract to nominate someone else to be the purchaser in their place. The new purchaser (Nominee) agrees to perform the obligations of the purchaser under the contract. 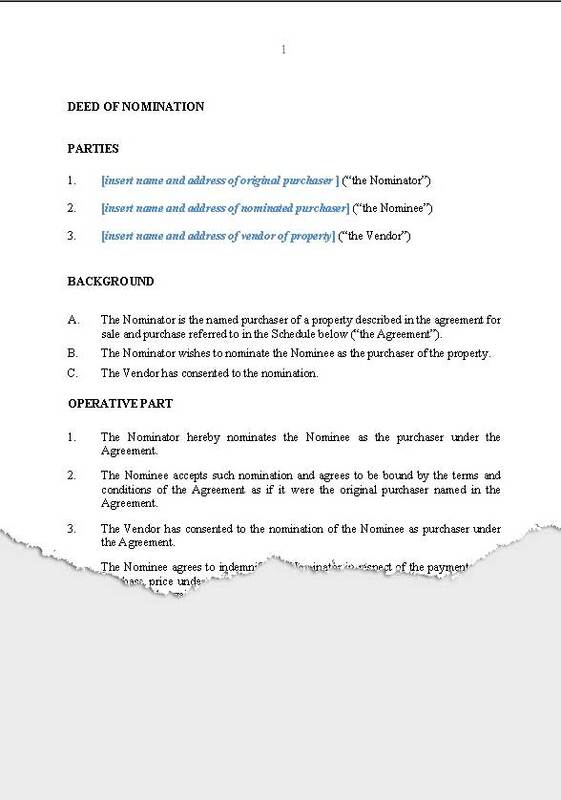 A copy of the deed can be given to the vendor who will complete the contract with the nominee. The original purchaser is still liable to the vendor if the Nominee defaults. If the original purchaser is to be removed completely, then a deed of novation should be used instead. A deed that provides for one person to take over contractual obligations owed by another, with the consent of the other party to the contract. In this way, the contractual relationship is replaced and the contract is enforceable by and against the replacing party. This creates a new contract (a novation) between the new party and the other remaining party. The exiting party is released from liability. A deed that provides for one person to take over a debt owed by another, with the consent of the creditor, so that the debtor/ creditor relationship is replaced and the debt is owing between the creditor and replacement debtor. This creates a new contract (a novation) between the creditor and new debtor. The original debtor is released from liability. An agreement that provides for a purchaser under a contract to be replaced entirely by a new purchaser with the agreement of the vendor. This creates a new contract (a novation) between the new purchaser and the Vendor (a novation). The original purchaser is released completely from further obligation.